In the initial R&D stages for our Tank Project we have to work out the most suitable way to interface from software to hardware - which I have never done before! One of those options is to use the parallel port, which allows us 8 data pins that we can use for controlling motors, etc. 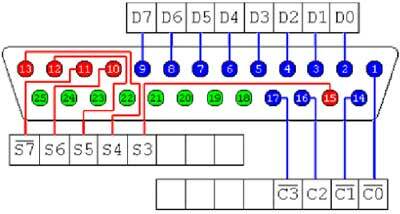 The layout of a parallel port is quite easy, there are 8 “D” pins for data with 8 matching “Ground” pins (shown in green below). As the output from the parallel port is about 5 volts, I though LED’s were a suitable was of testing this out, so I went searching through our garage to find a parallel cable from an old printer and a bunch of LED’s. I found a bunch of tristate LED’s - tristates have 3 legs instead of 2 and provide 2 different colors depending on which legs have power to them. For example, if the circuit connects the left leg and the middle leg, it produces green light, whereas the right leg and middle leg produce red light. Soldering 4 of these LEDs to a board meant I could join all the middle legs together which would be what I connect the ground wire from the parallel port to and the other 8 legs to the 8 data wires. In order to control when each of the data pins has power to it or not, you simply have to write 8 bits (a byte) to the parallel port where each bit corresponds to a data pin. In linux this is quite simple as you can write to /dev/port just like any other file. This is the first time I have ever written a program that uses hardware, albeit really basic hardware, but this has a lot of potential. Instead of turning on lights, this small current could trigger relays to do more exciting things, or in our case power transistors using PWM to control motor speed for our tank - and its so simple!